For much of the oil industry’s history the workplace has been dominated by men, and over the last decade that has slowly begun to change but there’s still plenty of work to be done. 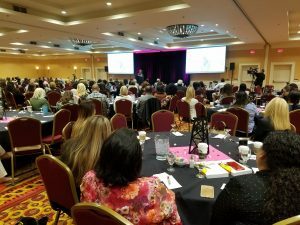 That was the consensus during the second annual Women in Energy (WE) Conference, held Oct. 16 at the Bakersfield Marriott Hotel and attended by some 250 women and men from Aera Energy, Berry Petroleum, California Resources Corporation (CRC) and Chevron. Aera’s Trina DeWitt (left) speaks on a “Leading Made Simple” panel at the WE conference in Bakersfield. 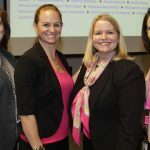 Joining her (from left) are Berry Petroleum’s Kristy Whitaker, CRC’s Katie Sanders, and presentation facilitator Susan Mazza. Studies by the American Petroleum Institute say that only 19 percent of the oil and gas workforce is made up of women, but that number will need to nearly double over the next few years. API estimates 142,000 women will be employed in the industry by 2020, but that number will need to increase to 184,000 by 2030. Much of that growth is attributable to retirements, but a growing pool of women in technical positions that were once previously filled by men. More importantly, the economic opportunities for women in the oil and gas industry are significantly higher than the rest of the workforce, and for women the jobs are moving into technical spaces that were once previously dominated by men. 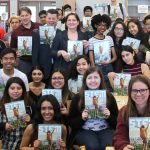 For those attending the conference it marked another opportunity to connect and a full day of sharing career experiences in the industry. Learning about leadership approaches and personality differences. Taking stock of strengths and opportunity for growth. 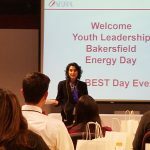 “It’s a dream come true for all four oil and gas organizations to come together,” said Aera’s Kristi Culligan, who organized the first-ever WE conference last year. She also served as part of this year’s planning team. Attendance was up 25 percent over last year. 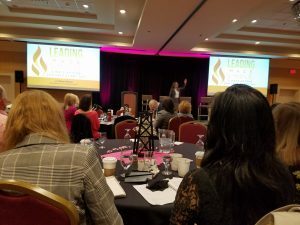 Morning keynote speaker Susan Mazza discussed “Leading Made Simple: Three Ways Anyone Can Lead Every Day.” Mazza is a nationally recognized leadership expert. Leadership is about speaking up, stepping up and standing up, she added. Simple yet powerful random acts of leadership can amplify your impact personally and professionally. 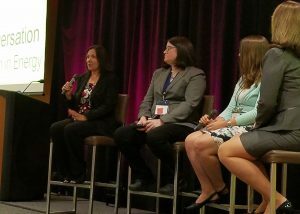 Mazza also facilitated a panel of “everyday leaders,” comprised of Trina DeWitt, a process supervisor with Aera; Katie Sanders, a CRC senior mechanical integrity engineer; and Kristy Whitaker, a geologist with Berry Petroleum. The panel agreed that significant progress for women has been made in the historically male-dominated oil and gas industry. Whitaker said the progress depends on individual companies. On a scale of zero to 100, some oil companies are still at zero while others have advanced far. DeWitt pointed out that Aera has hired many women in executive, professional and managerial roles. Sanders noted that numerous oil and gas companies have launched workplace initiatives to make the playing field more equal for women.